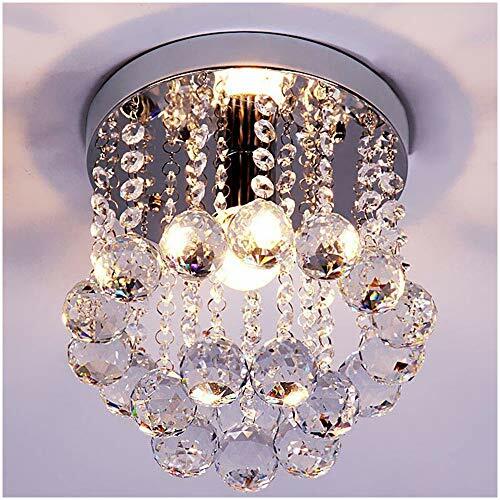 ZEEFO Crystal Chandeliers Light, Mini Style Modern Décor Flush Mount Fixture With Crystal Ceiling Lamp For Hallway, Bar, Kitchen, Dining Room, Kids Room (8 inch) by ZEEFO at Result BD. MPN: ZF-Ceiling Light. Hurry! Limited time offer. Offer valid only while supplies last. Warnings ★Must be Installed By Professional Electrician. ★When Installing, cleaning lamps and replacing light blubs, must cut off power supply. ★Must be Installed By Professional Electrician. ★When Installing, cleaning lamps and replacing light blubs, must cut off power supply. ★The surface of the lamp and the electric Wire should be avoid scratching when mounting, the electric insulation gloves must be worn when installing. ★This Beautiful Crystal Chandelier with High Quality, Ideal for Kitchen, Kids Room, Hallway, Dining Room, Bedroom, Passway, Bar, and more. ★Mini Style: ZEEFO Modern/Contemporary Crystal Ceiling Light, Flush Mount Fixture. 24 Months Warranty. Any doubts and questions, please kindly contact us. 【Elegant Design】This Crystal Chandeliers light,Suggested Room Fit: Kitchen, Kids Room, Hallway, Dining Room, Bedroom. 【Easy to Install】 you only need to hang up a string of beads we made already, which is easy to install. Must be installed by Professional Electrician. When Installing, cleaning lamps and replacing light blubs, must cut off power supply. ► 24 Months Warranty. Any doubts and question, Please kindly contact us. If you have any questions about this product by ZEEFO, contact us by completing and submitting the form below. If you are looking for a specif part number, please include it with your message.